Airline Highway: A Play (Paperback) | The Drama Book Shop, Inc. Airline Highway is a rollicking play that, with great insight, humor, and subtlety, examines a tight knit community of "outsiders" over the course of a single, legendary day. The Hummingbird Hotel is the figurative or literal home for a group of strippers, French Quarter service workers, hustlers, and poets who are bound together by their bad luck, bad decisions, and complete lack of pretense. Presiding over them is Miss Ruby, a beloved former burlesque performer who has requested a funeral before she dies. As the people whose lives she has touched gather to celebrate her, they must face themselves, each other, and the consequences of the choices they have made. Airline Highway shows us the tenuous hold that community, authenticity, and real-time ritual have on a rapidly gentrifying New Orleans. 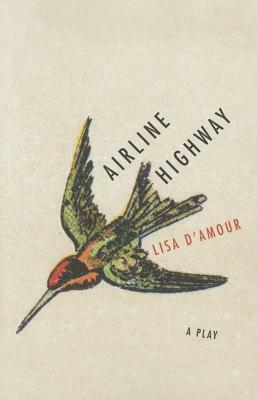 LISA D'AMOUR is a playwright and interdisciplinary artist whose work has been produced on Broadway, in regional theaters including Steppenwolf, Playwrights Horizons, and Woolly Mammoth, and, with her company PearlDamour, in many unconventional locations. Her play Detroit was a finalist for the 2011 Pulitzer Prize in Drama.